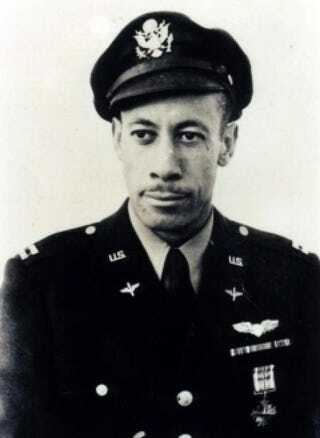 Lowell C. Steward after his graduation from flight training at Tuskegee Army Air Field in July 1943, in Tuskegee, Ala.
Los Angeles Chapter, Tuskegee Airmen Inc.
Lowell Steward, a former Tuskegee Airman who flew nearly 200 missions in Europe during World War II, died Wednesday at a hospital in Ventura, Calif., The Guardian reports. He died of natural causes, said his son Lowell Steward Jr.
“He would say, ‘We had to be better because we were looked at harder. The odds were stacked against us. Some people wanted us to fail,’” Lowell Jr. said, according to the newspaper. He was ultimately awarded the Distinguished Flying Cross, the report says.